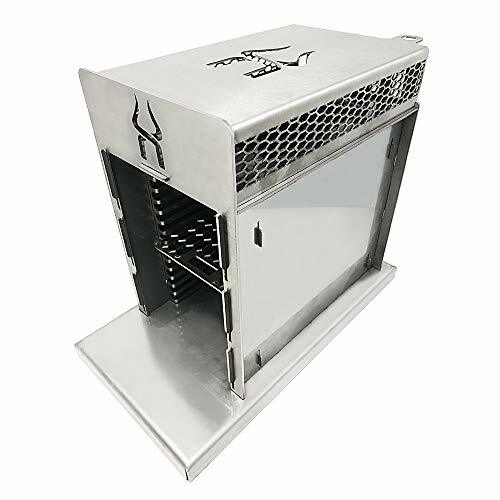 The original Vida upper heat gill is a gas grill for everything that needs roasting flavours and is therefore perfectly suitable for Rib Eye steaks, filet, strip loin, entricte, tomahawk or flat steak, also salmon, shellfish, flame pie etc. Ready to use in seconds, it creates a lightning-fast browning of the food thanks to the enormous burning temperatures. Crispy outside, soft inside. The grill has 15 slide-in levels for grilling with different intensity, for re-cooking and for drip tray. The device itself and the grate are made of high-quality stainless steel and can therefore also be cleaned in the dishwasher. You will receive a kit from which you can build the Vida upper heating grill in a few steps.